Isabelle Clement - Director of Wheels for Wellbeing (WFW). NB italics mark post-meeting clarification. Charlie and Isabelle thanked Peter for agreeing to meet with them to clarify and discuss the issues that GSTT have with the proposed cycle track plans by St Thomas’ Hospital. Isabelle outlined the work of Wheels for Wellbeing, the Brixton based inclusive cycling charity, and Charlie outlined the work of Lambeth Cyclists, the 950+ member local borough group of the London Cycling Campaign, and that he is also a local cycling instructor. Both emphasised that their groups are very keen on good walking environments as well as good cycling ones, and that they want a solution that makes cycling safe for all across Westminster Bridge that doesn’t disadvantage pedestrians. It was agreed that the purpose of the meeting was to explore ways that cycling as well as walking for all people could be made safe and appealing here. Peter explained that GSTT is supportive of cycling and of staff cycling to work. It offers the Cycle to Work Scheme and organises cycle workshops for staff. Peter is meeting the GSTT staff Bicycle User Group tomorrow to talk with them about the petition GSTT started last week. Charlie said that GSTT had not come across as particularly cycle friendly because it has not proposed any positive cycling alternatives to the TfL proposals. He found this surprising given the benefit cycling has in terms of air pollution, obesity and related diseases, fitness for people. Isabelle talked about the benefits of cycling for people with disabilities. Charlie also said that he understood GSTT had favoured a ban on cycling on the Thames Path near the hospital a few years ago (overturned by Lambeth Council in favour of ‘Pedestrian Priority, Considerate Cycling Encouraged) but had not at the time proposed measures to make Lambeth Palace Road a cycle friendly alternative. He cited as examples of people who will benefit from good cycling infrastructure a sixteen year old he knows in Kennington who wants to cycle across Westminster Bridge to her new school, Harris Academy, and the children he has taught at the nearby Oasis Johanna primary school who would like to cycle in their neighbourhood. Peter perceived that GSTT needed to do more to come across as cycle friendly to those who are not staff. He stated that the Trust is ‘not in principle opposed to cycle superhighways and floating bus stops’. It was agreed a constructive discussion could take place with a view to arriving at a satisfactory design for people walking and cycling. Charlie sought clarification about which parts of the plans GSTT has concerns about. Peter said that GSTT does not have a view either way on the cycling plans for Lambeth Palace Road, nor does it have a position concerning the proposed floating bus stop opposite the main entrance on the downstream side of Westminster Bridge. Peter explained that it is the proposed floating bus stop on the upstream side of Westminster Bridge that the Trust is concerned about. This is because most of the Trust’s visitors (staff, patients and visitors) come from South London – many elderly, many with buggies, many with mobility or sight issues and the bus stop is perceived by the Trust to be the most used of the bus stops. Isabelle suggested that it was likely that the bus stop on the other side of the road had a similar number of users, given that the people who arrived from the south would most likely return back to the south. A particular concern for the Trust is people’s herd mentality at this busy bus stop as they alight from buses and cross the cycle track towards the hospital, maybe running late for an appointment. Isabelle cited a report following extensive observation in Croydon which had demonstrated that the speed of people cycling correlates to the density of the pedestrian population – a more densely populated areas results in people cycling slower. Peter said that the Chairman of GSTT had visited the cycle bypass outside Whitechapel Hospital on Mile End Road on a Saturday morning, albeit not the busiest time of week for hospitals. While acknowledging TfL’s monitoring showing that there have been no collisions between people cycling and walking since its introduction, he reported that the stop is not as busy as outside St Thomas’ being on four bus routes only, with three of the four starting nearby so only one with many people alighting. The Chairman reported that the Whitechapel floating bus stop is just long enough for two buses, and its narrowness meant that manoeuvring a wheel chair on it required skill. In his time observing the Chairman saw two near misses (neither as it happens, he reported, the fault of the people cycling) which suggests that collisions could happen. Charlie and Isabelle concurred fully that the islands must be wide enough to allow safe use by wheelchair users, those with buggies etc. Charlie said that he had been told that there have been no collisions in the three years since the installation of 14 (actually 15) bus stop bypasses on the new Lewes Road cycle track in Brighton. He also noted that there are 30+ floating bus stops in London which have been in place for many years. Peter emphasised that many more buses stop outside St Thomas’ and in addition to regular buses there are many tourist trip buses. The three exits from (Hetherwick’s new Routemaster) buses means that people will cross the track all along the bus stop area. Charlie asked whether TfL had proposed any measures to reduce the perceived risk at the GSTT bus stop. Peter said that TfL proposed a longer raised crossing for pedestrians at pavement level. Cyclists would go up a ramp from carriageway level. Peter said that GSTT had some ideas that they planned to propose to TfL. He requested, and Charlie and Isabelle agreed, that these are not yet for the public domain. Peter then outlined the ideas in confidence and we discussed them. Peter reported that the Trust will need to decide whether to take legal action (although it is expensive) against TfL – there is a 3 month time limit within which this can happen and it is considered responsible to do so earlier rather than later within that time frame. 1. They felt that both the upstream and downstream bus stops outside the main entrance needed to be considered, not just the upstream one. In their view, the fact that the upstream bus stop was also uphill to the bridge meant that cyclists would generally be travelling at lower speed than those going slightly downhill on the downstream side. 2. Regarding the upstream side, they expressed surprise that the tourist buses stop is nearer the hospital than the one for TfL buses. To reduce walking distance to the hospital could not TfL switch them around? In fact, was it crucial that Tourist buses stopped outside the hospital at all? Is there an alternative location that would remove stress and delay at this bus stop? 3. It is particularly important here that visually impaired people know a safe time to cross the cycle track. By switching the bus stops around as in point 2, TfL’s buses are nearer the existing Toucan. This means that while cyclists are held at the Toucan lights crossing (which provide enough time for people to walk across four lanes of motor traffic) there is considerable time for people to cross a one-direction cycle track. A Pelican or Puffin crossing timed to start a few seconds after the Toucan crossing would allow visually impaired people to know a safe time to cross, without requiring people cycling to stop a second time for the lights. 4. The floating bus stop lozenge on each side could be extended to meet the Toucan Crossing, so that people could have access to and egress from it via the Toucan Crossing. 5. 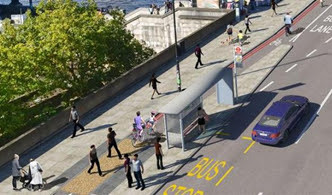 The buses could have an audible warning to passengers that the bus stop has a cycle track to cross to reach the pavement. 6. A frail or disabled warning triangle sign (DOT544.2 potentially with added ‘blind people’ plate) could be used; Isabelle suggested that TfL may be able to get permission to paint this on the cycle track where it would be more noticeable than as a regular sign. 7. They had noticed that there is no seating on the walkway between the bus stop and the main building entrance to St Thomas’ and suggested that this would be worth considering. Isabelle said that the ramp from Westminster Bridge Road to the hospital approach was quite steep and challenging. An access audit was suggested (Peter did not know whether one had been done – he would put the question to the Transport Users Group). Peter said that GSTT very strongly resisted the idea of having any pedestrian barriers on the floating bus stop island. Charlie and Isabelle both stated their full agreement with this position. Peter hopes the change in Mayor will result in a less dogmatic attitude to cycle tracks. His view is that Holland doesn’t have a problem with floating bus stops etc. because they have a long established cycling culture; in 50 years we may too. Charlie said that he felt this would happen in a much shorter time scale. He reported that nearly every primary school in the area takes advantage of Bikeability training for pupils which includes practical exercises to nurture safe and considerate cycling with regard to pedestrians. Isabelle and Charlie spoke about the current bias towards young men cycling – being more accepting of mixing with motor traffic and fit enough to try and compete in a 30mph cycling culture. They felt that the new cycling infrastructure, and to an extent the recent change to 20 mph limits in many inner London boroughs, is resulting in a wider demographic cycling, changing the culture. Charlie asked what the statistics were for the number of people killed or seriously injured in traffic incidents right by the hospital. Peter said that he didn’t know. Charlie (from https://tfl.gov.uk/corporate/safety-and-security/road-safety/london-collision) stated that, between 2005 and 2014 and from the middle of the bridge round to the end of the hospital on Lambeth Palace Road, seven cyclists had been seriously injured and one killed, all in collisions with motor vehicles. Six pedestrians had been seriously injured and one killed, all in collisions with motor vehicles. No pedestrians or cyclists had been seriously hurt or killed in collisions with each other here. Charlie noted that a large number of people cycled in this area on the pavement (both the legal shared section and the non-legal section) and asked whether there were any collisions. Peter said that he was unaware of any, though there had been a lot of concern expressed at the time of the installation of the existing shared space and track a number of years ago. He has occasionally been surprised by the presence of a cyclist on the pavement. Charlie said he was pleased that to the best of their knowledge there were no collisions. He showed Peter photos he had taken that morning of people cycling at a reasonable speed, towards the shared-use pavement, along the pavement behind the bus stop outside the hospital on Lambeth Palace Road, to avoid being held up in or navigating between the buses and other vehicles queuing for the lights – in effect an informal floating bus stop, though with much less footfall than outside the main entrance. Charlie and Isabelle expressed their appreciation to Peter for taking the time, on behalf of the Trust, to have a constructive discussion with them and emphasised their willingness to meet again to review plans. In terms of positive action that the Trust could take to show their support of cycling, Charlie said that he had been in discussion with Lambeth Council’s sustainable travel team about a conference on ‘How will we get more children making more journeys by cycle in Lambeth? Lambeth Council have asked Charlie to set this up and he proposed that GSTT, maybe at the Evelina wing, could offer to host the conference. Peter said that he supported the idea of holding a conference at the St Thomas’, given availability of space.